There are lots of ways to show Mom you appreciate her with jewelry. 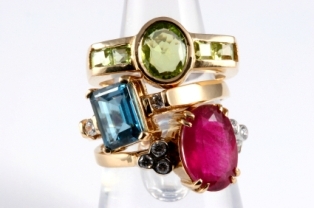 From pendants to rings, there are numerous jewelry options to choose from. Click on the link in any of the following pictures to see purchasing information for these mother-inspired pieces. This sterling silver heart-shaped ring shows off the form of a mother and child. The mother is reaching her hand to touch the child's head. The ring is nickel free and retails for under $25. Consider giving mom the earrings that match her mother and child ring. These sterling silver earrings feature the same mother and child heart design as the ring. Each earring measures 1.7 centimeters and weighs 2 grams. They retail for $35. Make a statement with this mother and child pendant by Star K. The pendant features a heart-shaped 8mm created sapphire. Mother and child are touching foreheads at the top of the pendant, which comes with a matching chain. The pendant retails around $35. This simple sterling silver pendant features a mother holding hands in a circle with four children. Their joined arms form a heart in the center of the design. The pendant mearsures 1-inch long and 1/2-inch wide and retails for $40. Customize this pendant with your children's birthstones. The sterling silver pendant features a mother whose arms form a heart shape you can hang up to eight charms from. The charms are sold separately. The pendant measures 1-1/4-inches by 3/4-inches and retails under $25. This small pendant is sterling silver with a gold-plated heart in the center. The type that wraps the outer edge of the pendant reads "The Love Between a Mother and Daughter Knows No Distance". The pendant measures .91-inches by .48-inches and comes with an 18-inch chain. It retails for under $30. These matching bracelets are the perfect gift for a mother and daughter. Made with pink and white imitation pearls, both bracelets feature a sterling silver heart charm and are adjustable. The woman's bracelet measures 7- to 7-1/2-inches and the daughter's bracelet fits size 0 to 12 months. The set retails around $95. This 14K yellow gold brooch sold by JewelsObsession features a mother and child together in an embrace, and the two figures form an open circle. The brooch measures .96-inches by .68-inches and retails for just under $425. Show off a bond between mother and child with this Wedgewood inspired blue cameo pin. The pin is made of blue resin with a sterling silver frame and back. It features a mother and daughter in white cameo. The pin measures 1.2- by .98-inches and retails for under $50. These mother and child drop earring feature a swan and her offspring, which makes a subtle statement about motherhood. They're made from lead-free pewter with a satin finish and retail around $40. This sterling silver bangle bracelet features the saying, "A Mother Holds Her Child's Hand For A Short While and Their Hearts Forever" engraved on the side. The bracelet features two intertwined hearts as well. It measures 3.3 x 2.7 x 0.3 inches overall and retails for under $50. Jewelry makes a great gift, regardless of whether it features a "mother" theme or not. Consider giving Mom any type of jewelry as a gift to show her how much you love her.